Online bingo games are basically a digital simulation of the physical land-based game of bingo. It uses virtual bingo cards and usually some kind of chat room to emulate the social aspect of playing the game in an actual hall. And just like real world bingo, there are a variety of different games available for you to play – include 90 ball, 80 ball and 75 ball. Plus some online-only exclusives that you won’t find in a brick and mortar bingo hall. The 90-ball version of the game is the type which is best known to the United Kingdom, and it has found widespread popularity across the world as well. It utilises 90 numbered balls, and bingo cards are provided which are marked out in a grid of 9×3 boxes, incorporating nine columns and three rows. Each of these rows contains five numbers, so each each card contains a total of 15 different numbers. These columns contain different numbers, with the first offering up numbers from the 1-9 range, the second 20-29, the third 30-39 and so on. In order to complete a single line, the player needs to mark off all five numbers in that line, while a full house is won by marking off every number on the card. 90-ball bingo games usually have a winning pattern of one line, then two lines and finally, the full house. One Line – One line across any one ticket is going to win you the first and lowest prize of the game. When this prize is won, the game then moves on to the two line pattern mentioned below. Two Lines – As the name suggests all you have to do to win the second part of a 90 ball bingo game is to cross off two lines of numbers. They must be on one single ticket and not on two different ones. When this pattern has been formed then the game moves onto the full house pattern described below. Full House – To win the top prize payout you will need to get all of the numbers on any one of your 90 ball bingo tickets crossed off. Depending on how many players there are this may take a fair few balls for someone to win! This, along with the 90-ball variation of the game, are the oldest known versions of the product. 75-ball is more known across the United States, and as the name suggests, it uses 75 numbered balls. The game is played on cards that feature a 5×5 grid. The centre of this grid is always left out as a free space, and therefore, each card contains a total of 24 different numbers. The top of the card will feature the word ‘BINGO’, with each of the letters appearing above each of the columns. The ‘B’ column contains numbers in the range of 1-15, and this increases up to 75 across the card. A winning line in 75-ball bingo can be created from a horizontal stand point, vertically, or even diagonally. 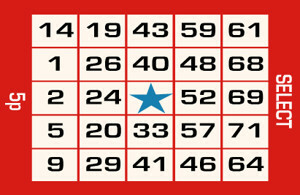 This type of bingo will also often feature patterns on its card, and can also be played in a variation known as ‘Speed Bingo’. Window Frame – The Window Frame bingo pattern is formed whenever all of the numbers crossed off any one bingo card except the second and fourth numbers on line number two and four, and the reason it is called the Window Frame is that it resembles a window frame of course! Witches Hat – The way in which this bingo pattern is formed is by having all of the number crossed off the bottom line, then on the next two lines above this having the middle three numbers crossed off followed by the remaining lines above this having the middle number crossed off. Coverall – All bingo games offer this type of playing pattern, the idea is to simply get all of the numbers on any one of your bingo cards all crossed off before any other player does. These Coverall bingo games often have the biggest payout attached to them, and are often the jackpot paying games. Any Three Lines – This is an easy patter to look out for, as soon as you get any three lines of numbers, in any position across one bingo card then you are the winner, if of course you are the first player to get it! Outside Bar – The Outside Bar bingo pattern is any line of two adjacent sets of numbers one of which must be touching any outside line of your bingo card, another easy to form pattern but one that could take a while to form! W Bingo Pattern – This is quite an unusual pattern but one you will definitely not miss when it forms, the W bingo pattern is, as the name suggests formed when you get the letter W on any one of your bingo tickets, the pattern must start in the upper left hand side and the last square of this letter is going to be the right hand side upper most position on your 75 ball bingo card. Being a relatively new variation of bingo to be made available, 80-ball merges the larger number of bingo balls with the card style of the 75-ball game. 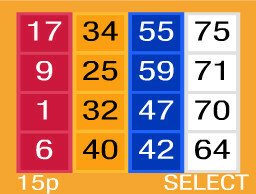 Games are played on a 4×4 grid and feature a total of 16 numbers per card. As with the 75-ball version, wins can be formed horizontally, vertically or diagonally, however this game doesn’t feature the central free space. Numbers are organised in ranges similar to others, with 1-20 showing in the first column, through to the last column incorporating numbers 61-80. Cards are usually colour coded as well, and as with 75-ball bingo, game cards can utilise pattern matching to win as well as lines and full house style games. This game is actually considered one in itself, as it is an online product, and is the first instance of online bingo leading physical bingo. Any Line – When you play an Any Line game of 80 ball bingo then all that is needed to win the game is to get a line forming in any direction on the bingo card, these games are fast paced and as such you will find they last a minute or so before someone forms such a pattern and wins the game! Coverall – To win a Coverall game you need to simply be the first player to get every single number on any one of your bingo cards crossed off and if you do then you are the winner. These Coverall games are the longest playing games using the 80 ball bingo format. Four Corners – One unusual pattern often found in play on 80 ball bingo games is the four corners pattern, the aim of this pattern is to simply be the very player to cross off, on any one card, the four corner numbers, and if you are the first player to do so then you have won the prize for that particular game. There are a few other online bingo games, as well as the three most popular varieties noted above. This starts, first of all, with 50-ball bingo, which provides players with a single card featuring an individual grid of 10 squares, made up of two rows and five columns. Each of the squares is numbered, and wins are created when a single line is marked off, or when the full house is marked off. Fifty ball bingo isn’t particularly common, but can be found in the Coconut Island room at Gala Bingo. In addition, you’ll find options such as ‘Joker Jackpot‘ bingo. With this product, you’ll be given a full deck of 52 playing cards, plus two jokers. Buying a single ticket will present you with nine cards from the deck. The rest of the cards are then dealt, and you need to match the cards appearing with those in your own hand. A ‘J’ pattern in the cards will win the first prize, followed by the full house of cards for the top prize. Two jackpots exist within the game as well – the ‘Joker Jackpot’, which is able to be won by winning in 16 cards or less, and the progressive ‘Super Joker Jackpot’, that requires you to win in 14 cards or less with the last card being the joker. Finally, ‘Deal or No Deal‘ bingo, which is based on the television show of the same name, uses the same type of tickets as the 90-ball offering. Four prizes exist within this version of the game, which equate to a single line win, two line win, full house, and the ‘Deal or No Deal Feature’ prize. The latter of these can be seen before each game draw commences, and on each side of the feature area will be 22 different amounts that are held within 22 boxes. The blue lower amounts will show on the left, with the red higher amounts on the right. A box is automatically chosen at random from the red ones, and this becomes the player’s box. The remaining 21 boxes then open to reveal numbers from 1-90, and each time a ball is drawn featuring the same number, it opens to reveal an amount from the prize board.